As I’ve said before, I’ve always hated scotch. To me, it tastes like putting a burning campfire stick in your mouth. And I’ve always loved chocolate. It is deep, dark, velvety smooth: a single whiff of it causes me to salivate. How can these two seemingly incompatible substances possibly co-exist together on my taste buds? Okay, I am being a little histrionic. I have willingly put them together quite beautifully before, in a delicious whiskey truffle, but that was quite a light scotch, and this time there will be no creamy tempering layer to soften the edges. But I am excited. 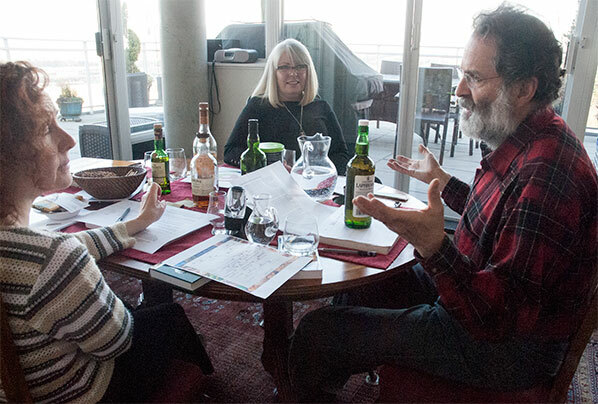 I love spending time with these two dear friends, who are very generous with their time and expertise, which is considerable, ranging from roof-top gardening to scoring music for four part harmony. And they really know how to throw a party. Yep, that’s correct – five. I originally bought eleven different chocolates to pair with the scotch, as there were some concerns about allergies, but because our tasting had been postponed, and the couple with nut allergies were unable to attend this time, I really had far too much. And Stephen is such an engaging teacher, I could have listened to him talk for hours. 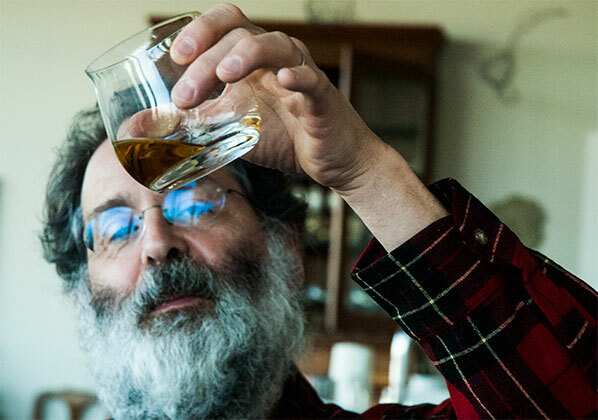 He is passionate about the “water of life”, and enjoys every detail of the process of making it and its role in creating the unique tastes we were about to sample. We hold the glass up and look into the depths of the liquid. I see a light gold, the colour of apple juice, or perhaps old gold. We warm the glass in our hands, rolling it back and forth, then inhale deeply into the glass. Once I have stopped coughing, I am able to ascertain a honey-ish aroma. The other tasters are more eloquent: blooming spring and summer flowers, nectar. We move on to the first taste: as the tiny first sip crosses my taste buds, my tongue curls, but when I hold a small amount in the bowl of my tongue and close my eyes, trying to breathe around the liquid, I have the sense of walking in the woods. Kathryn suggests leaf mold and mushrooms, Stephen goes for: sweet plums, a little apple, honeysuckle, nasturtium, fruit cocktail, custard and nutmeg. We swallow and the back of my throat is hot. And how will this go with the chocolate I have chosen? On its own, we pick up the odors of forest floor, prickly on the nose, honey. Then, an earthy taste, coffee, caramel, lavender. Mmm. 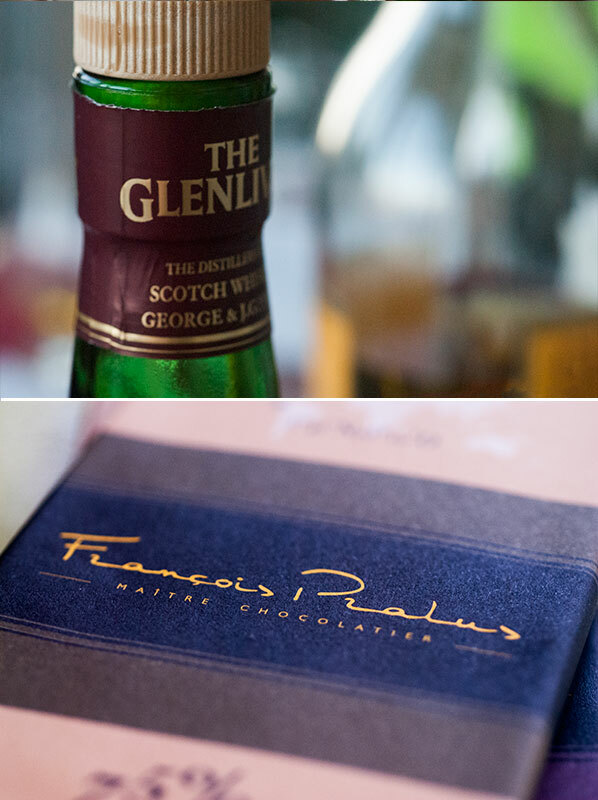 Together however, the scotch lends a sour quality to the chocolate that cuts through its smoothness, and blunts its finish. Verdict: not a good match, although the chocolate is so good. 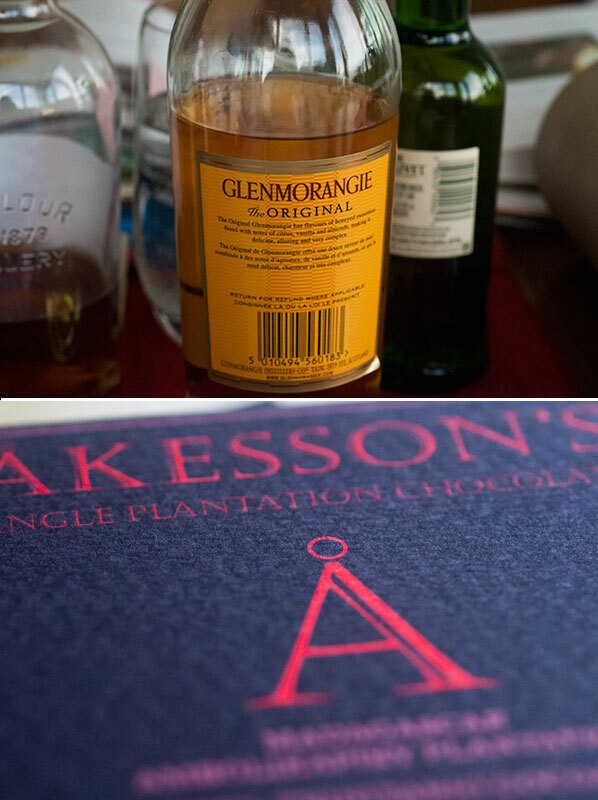 I feel like an old hand at this point, and am able to pronounce that the Glenmorangie looks like wheat straw/pale gold. We agree that it has a bouquet of butter, butterscotch, vanilla, crème brulee, eggnog, rum, butter tart, vanilla and nutmeg. I am now an expert in holding a tiny amount on the tongue and between the three of us (my partner is not imbibing – he is our designated driver and photographer/videographer – he is wonderful), we determine it has flavours of peach, olive oil, allspice, peach, and the feel of a warm blanket, oily, unctuous. To me, it feels like a shot of novocaine, leaving my mouth tingly. The chocolate has a citrus aroma. With a smoky flavour to begin, followed by orange oil, and a pleasant, peppery bitterness. Once again, with the scotch, this chocolate tasted medicinal. One of our tasters suggested a hint of dryer lint, as well! Okay, this is fascinating. Clearly, I am way off in my estimations of what will make for a pleasant combination of tastes. No doubt, this has a good deal to do with my ignorance of scotch. One whiff of this, and I begin to smile. Now this is more like it. I detect aromas of raisin, currant, molasses, demerrera sugar. Stephen adds mince tart, custard and banana. When we let this one swirl on our tongues, there are definite notes of chocolate, spices, Christmas cake, coffee, mince tart, pecans. An explosive taste. Mmmm. A scotch I may just like. 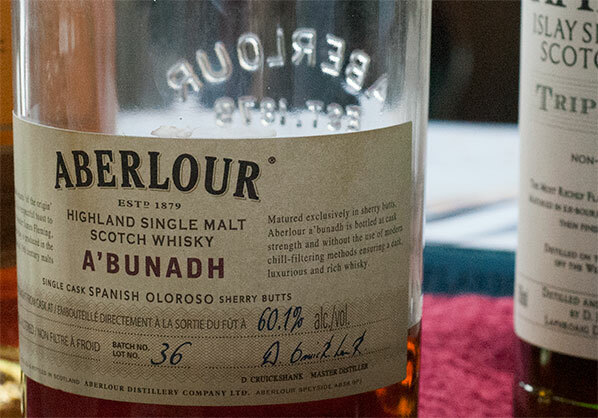 Perhaps it has something to do with being matured in sherry casks. Gives the aroma of a very chocolate-y blackberry, coffee, prune. It too, has a rich explosive taste: dried tree bark, blackberry, spice. And, how wonderful – it tastes heavenly with the scotch. The dark rich fruitiness of each is heightened and mellowed into a long finish. From the first whiff of this, I am reeling. My first image is of wet hemp, creosote – I am tempted to say, it reminds me of old sailing ships! Kathryn gasps and exclaims: “iodine, Ozonol, motor oil”. I add: wet cloth bandages. Stephen is more complimentary: wood smoke, campfire. I don’t want to go near this with a barge pole, but we are a team now, and Kathryn looks at me with an “In for a penny …” look. We nod and throw back our measures. It is stunning how bad this tastes. Peat, campfire, “like sucking a burnt, wet stick”, followed by decaying fish. Stephen has a differing opinion: ripe, smoked fish, grilled oysters, bacon, umami, airplane fuel (in a good way), hot chocolate. He is intrigued and clearly adores it. Spicy dried Serrano peppers paired with single origin Dominican Republic dark chocolate. The peppers originate from the mountainous regions of Mexico, and are dried and stone ground. The chocolate is tangy with the aromas of berries, particularly Saskatoons and blackberries. 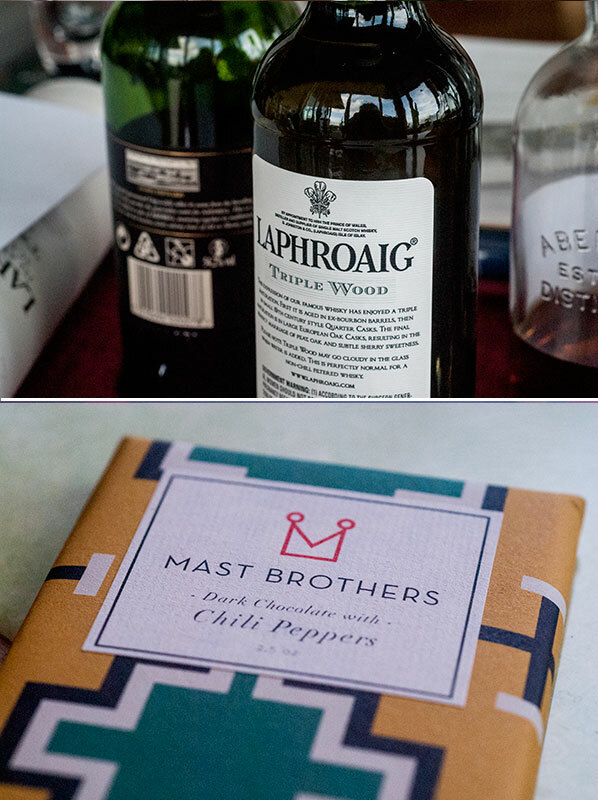 The deep, dark chocolate taste is immediately cut with a spicy chili burn. Beautifully bitter, but I doubt I could have more than a single square of this chocolate at a time. Very spicy, with a burn at the front of the mouth. When the two are combined, Kathryn and I cannot taste anything but the dreadful scotch, but Stephen is able to taste creosote, ointment and “the feel of second degree burns”! I recklessly take a good sniff and am hit with the aromas of iodine, wet hemp, and burnt sugar. Stephen smells chestnut, burnt sugar, dark molasses, not much smoke. Upon tasting, I get leather, LOTS of smoke, campfire, Lapsang Souchong tea, and an oily bacon flavour. He adds: bacon, crispy fat, and … S’mores! Also hot tarmac. And, as with the last one, claims this is a good thing! I have a feeling my leg is being pulled, but he is rolling the scotch around in his mouth with a look of curiosity and excitement. I don’t get it, but it is highly amusing. 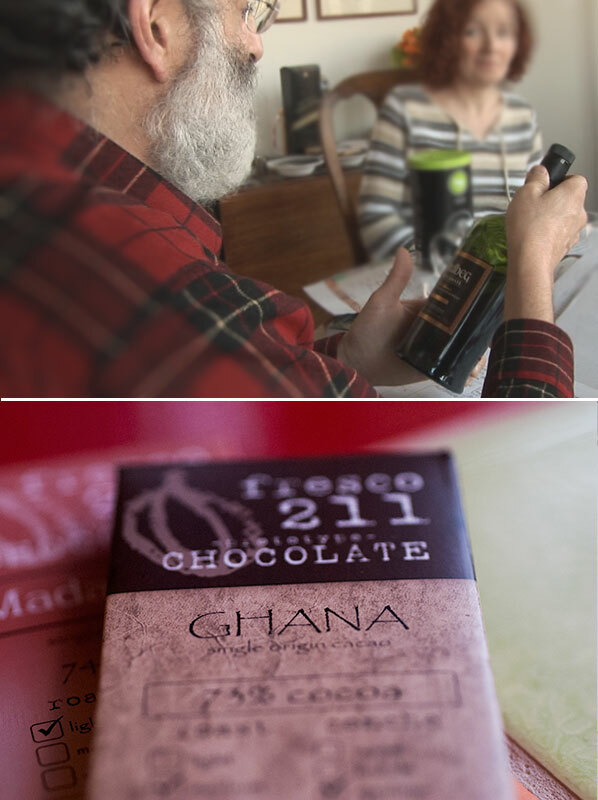 Ghana beans are known for classic cocoa flavor. This bar has been described as thoughtful, comfort food, likened to a cup of hot cocoa, which is why I thought it might go well with a smoky scotch. It has an aromatic perfume of freesia, tropical fruit, kiwi, mango and coffee. Stephen finds it rich, dark and loamy. 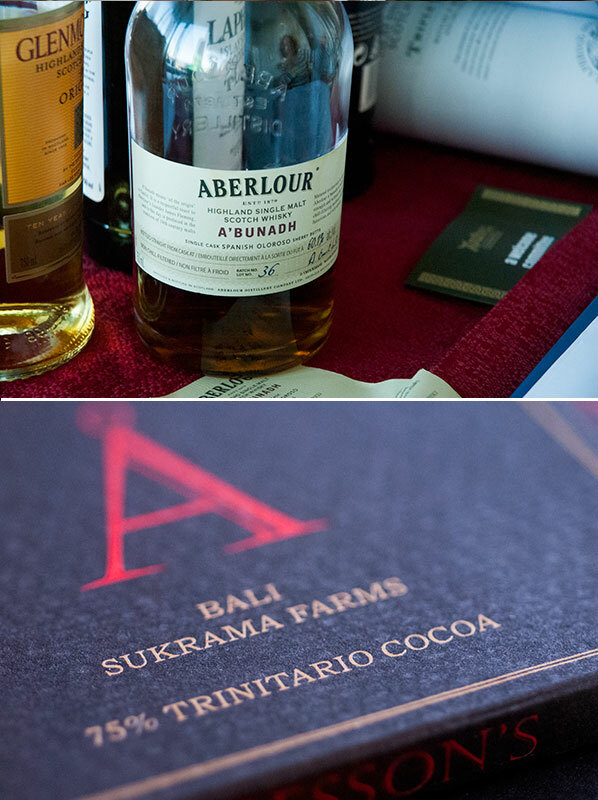 When he tastes the scotch and chocolate together, they accentuate each other’s richness, the coffee notes turn to espresso, and the bitterness intensifies .. in a good way. Feeling a little lightheaded, which could be from all the laughter, as well as the scotch, Kathryn and I return to the chocolates while Stephen, while not “throwin’ us oot the door” refuses to let good scotch go to waste, and dutifully finishes up what we refused to drink. 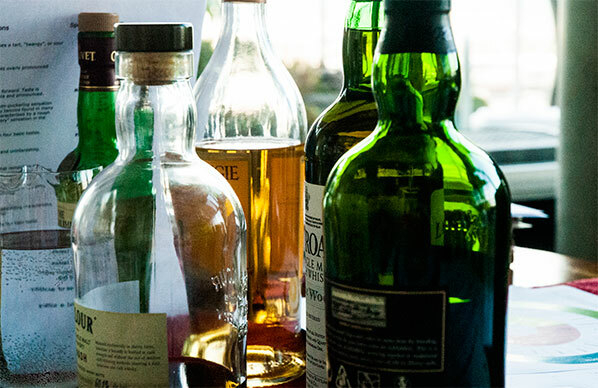 Although we found only one good pairing in the lot, I am very grateful for the education in scotch lore, and admit a grudging admiration for the palate of my friend. 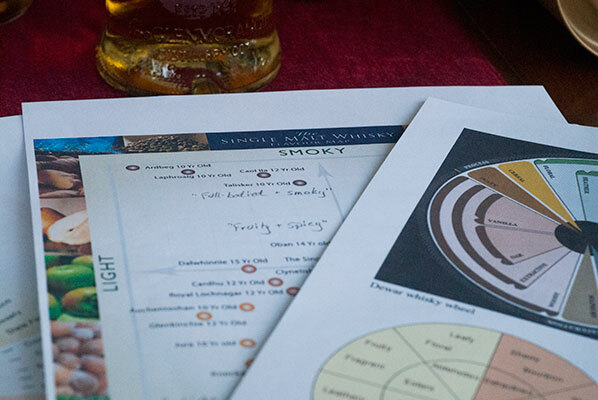 In short, I will never be a scotch drinker, but the exercise has been wonderful for the science of putting tastes, textures and aromas together. I realize I have a lot to learn. … and I have discovered some wonderful, new to me chocolatiers, whose bars I will enjoy “straight up”.